Lightly sweat the onions in a small amount of oil. Add tea leaves and Dashi stock. Bring to boil, simmer for 5 minutes. Strain immediately because the stock will become too tannic if allowed to steep for too long. Season the scallops with the cayenne pepper, ponzu sauce and salt, then wrap in pancetta. Sauté the green onions and shallots in olive oil. Add the stock and Edamame peas. Season with salt and pepper and cook until soft. Mold the risotto onto a serving plate. 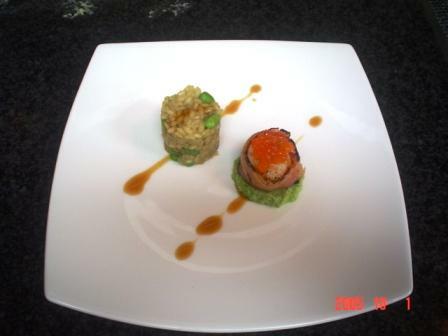 Place a pool of Edamame puree next to the rice and place a seared scallop on top of the puree.